Use Microsoft’s own Windows 7 USB/DVD download tool to create a bootable drive you can install Windows 7 from. You’ll need a Windows 7 installer ISO file to run this tool. If you don’t have one, you can download Windows 7 installation media for free from Digital River — you’ll need a legitimate product key to use them, though. Note that Windows 8 and Windows 8.1 have different product keys, so you’ll need to jump through hoops if you want to install Windows 8.1 with a Windows 8 product key. You may just want to install Windows 8 and upgrade to Windows 8.1 from within Windows 8 — that’s Microsoft’s officially supported method.If you have a Windows 8 or Windows 8.1 product key, you can download installation media directly from Microsoft and create a USB drive all at once. Download the appropriate tool from the Upgrade Windows with only a product key page. Run it, provide your product key, and tell the wizard you want to create a bootable USB drive. 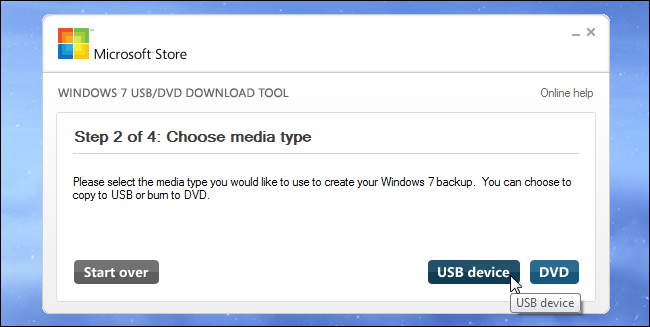 If you already have a Windows 8 or 8.1 ISO file and you want to create installation media without redownloading anything, you can actually use the Windows 7 USB/DVD download tool for this. Just provide the Windows 8 or 8.1 ISO file when prompted. The tool will happily create Windows 8 or 8.1 installation media if you provide the appropriate ISO file. If you need to boot into DOS to use a low-level firmware upgrade, BIOS update, or system tool that still requires DOS for some reason, you can use the Rufus tool to create a bootable DOS USB drive. Rufus uses FreeDOS, an open-source implementation of DOS that should run whatever DOS program you need to use. Became a bit of a Geek when I got my first computer (C64) when I was 13. Worked on solutions for schools, homes, etc including the Sydney Opera House and Super Yachts. Proudly powered by WordPress | Theme: quest by David Chung.